Understand these Computer Hardware terms? If not, then this website on computer hardware is right for you and if you do, then why not learn a little more? 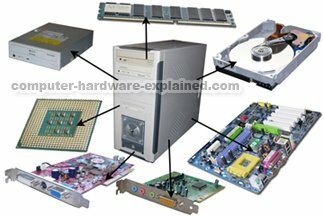 computer-hardware-explained.com is designed to explain all the computer basics from understanding computer components to putting them together and building your own computer. In building this website I seek to avoid all the ‘computer jargon’ and all the difficult computer terms, that are loaded up onto so many websites. This website will explain, step by step all the computer components through easily understood tutorials and any computer terms that need to be understood will be well explained. If after this you are still frightened of computers and superstitious that they will just stop working, then read my article, Computers are not scary. After you feel you have a significant knowledge in this area, then why not follow my guide to building your own computer and choosing the correct components for you. If you’re looking for business workstations for your home office, depending on the type of work you do, your needs can vary greatly. Major computer companies do not always sell quality computers for cheap prices. Instead the advertisements often target those who understand little about computers. After you have read this website and understood PC hardware, you will know what makes a computer and be able to build a quality desktop or notebook computer for a much cheaper price. There are also many reviews on this site, designed to allow you to choose computer components that suit your needs. If you have any questions than don’t hesitate to contact me. There are a number of high quality websites that do sell computer hardware, computer components, printers, and more. Want to find out whats on this site? Use the search below to find valuable answers on computer-hardware-explained.com or on the World Wide Web.